Last week was up and down…a bit frustrating. 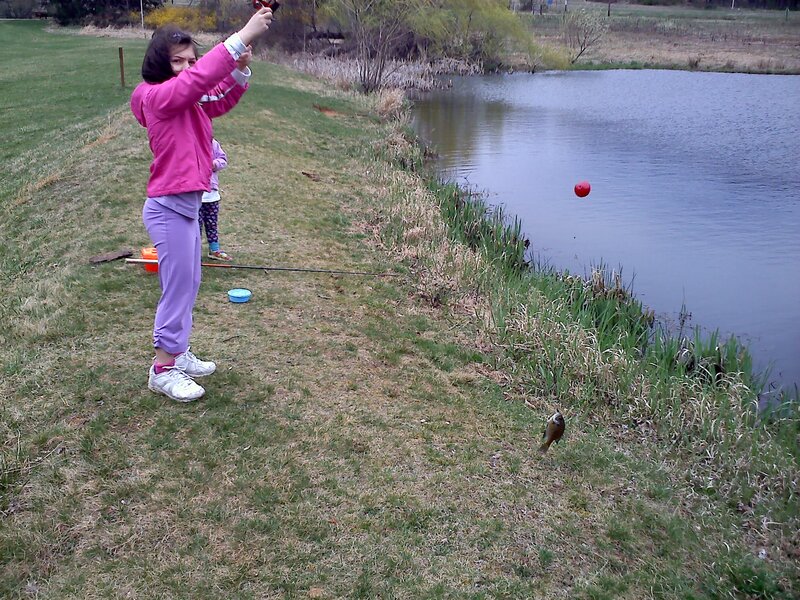 First, the moment of the week…my 7-year-old caught her first fish ever. From what we can gather, it’s a sunnie/blue gill. Caught in a pond that was about 5 minutes driving from our house. I’ve never really fished. I only got into fishing recently when my daughter expressed an interest in it. My philosophy on parenting includes the idea that you expose your kids to as much as possible when they’re young, then you let them gravitate towards areas of interest, then you support them. Well, my little one was interested in fishing. So she got a fishing rod as a birthday present from her uncle, and off we went fishing. We went once last year, and this was the first attempt this year. It’s not easy for me–I’m terrible with the hooks, I get grossed out by putting the worm on the hook and I really don’t like taking the fish off there. But she was thrilled. So we are eagerly anticipating the start of fishing season on April 7th. 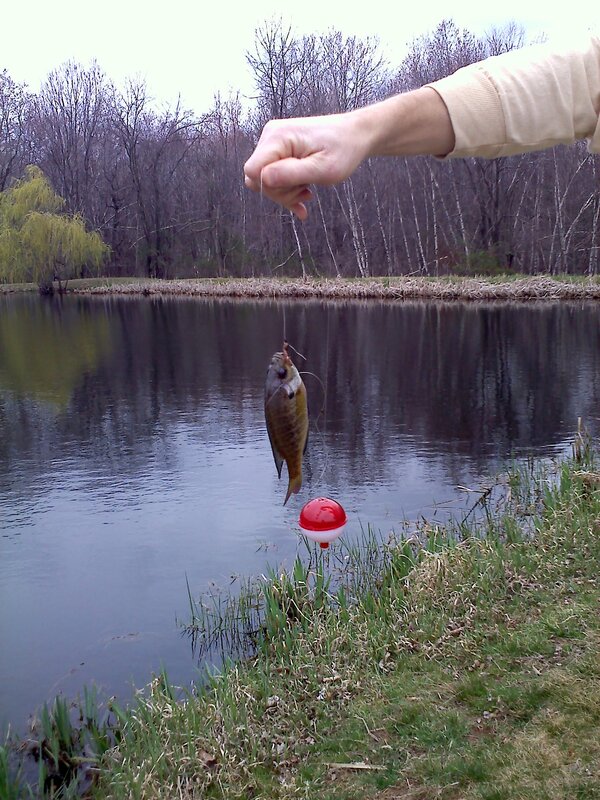 Our area is perfect for fishing–there are a million places to go all within close proximity. So, fishing it is. Fitness wise it was another frustrating week. At the start of the week, I was just getting over being sick. Mid-week was better, but by Friday I was back feeling sick. Same stuff–chills, feeling like I got hit by a truck, fatigue, coughing, the whole nine yards. Although I feel better today, I’m going to the doctor. I’ve got to get this figured out. I feel like I’m taking two steps backward for every step forward. Between the foot injury and the sickness, I’m not able to get into any kind of groove. Pikes peak is 143 days from today, and if I don’t get into a groove soon I’ll have to start re-thinking my goals. I’m itching to run today, but I don’t want to push it. I’d rather take an extra day off to make sure I close out this sickness. Today is hopefully one final day off with a trip to the doctor. Then I can get cranked up again tomorrow. Still unsure whether I was fully recovered from the weekend’s sickness, and having an early start for work this morning, I decided to try a short but hard strength workout. I aimed mostly at the upper body, since I hoped to get a run in later in the day (once I arrived at my destination). Came up with this: squat thrusts (10 reps), 10 minutes of wood splitting, chin-ups (overhand and underhand). All of these were done as intensely as possible. Just over 20 minutes of this (two sets) left me breathing heavy and sweating like mad. And I only did about 10 chinups total (including both sets overhand and underhand). Wow is that weak. In Philadelphia this week. Back to my home town. As the day ended, I had a decision to make: attempt a quick workout or get to bed early and go a bit longer tomorrow morning. I elected to get to bed early. If the fitness center in my hotel had a step machine, I might have thought differently. But no go. I felt good about this eating day. I could have easily caved at lunch and dinner, and also in the hotel where there were awesome-looking Philly soft pretzels freely available. One of my favorite things! For dinner, I decided to forgo the company dinner (and the handful of soft pretzels) for a trip to the grocery store. I love it when there is a fridge in the hotel room…I was able to buy breakfast for the next couple days as well. In the afternoon, we got lost on the way from our client meeting to the hotel, which ate up about 20 minutes of time I would have spent on a second run. Ended up still going out, only for about 35 minutes. Just over 4 miles. My heart rate monitor wasn’t cooperating, so I ended up just running. It was probably harder than I should have been running, but it wasn’t super-hard. I did manage to hold back from what I wanted to do–given the frustrations of the treadmill then getting lost, I really wanted to run all out for a set of intervals. But I was worried about the potential for injury, so I just took it relatively easy. Total on the day was about 10 miles and about 1 hr, 35 minutes. Some good treadmill incline in there. Eating was good until I went off the rails late in the day. pm: Run 7 miles. Tried a trail that’s close to my house and my gym–Round Valley Reservoir. It was really convenient to be able to use the gym’s facilities to change before and shower / change after the run. The trail was great. I will definitely be back to this trail. Although I might wait to hear the outcome of this first. Woke up with a lot of stiffness and soreness, especially in my calves. Wondering if I was suffering from some sort of delayed onset soreness from that body weight workout I did on Wednesday. Decided to go for a bike ride, which ended up being great. 54 miles, on a route that I haven’t done in a while. I started out feeling great, but ended up feeling really bad. The last hour felt like it was 100% into the wind. Not sure if it’s loss of endurance (I haven’t been out for this long in a while) or something else. Woke up feeling like crap. Day off. Towards the end of the day, I felt good enough to go outside and try splitting wood for a few minutes. Not the greatest idea. By evening I was not interested in anything but sleep. Still feeling like crap. Another day off. The mental approach that I take into any endeavor has more influence on the outcome than anything else. I was reminded of that this past weekend. One of my girls recently got into fishing. I’ve been trying to get her out fishing to make it fun and help her (and me) learn how to cast and actually catch a fish. It’s been a good experience so far. This past weekend, however, I wasn’t interested in going. We had a long day Saturday, and Sunday was looking pretty busy as well. But I still thought I should make an effort to see if my daughter wanted to go fishing. So I half-heartedly asked if she wanted to go fishing. The predictable response was “no.” I happily went back to whatever I was doing. But for some reason I couldn’t stop thinking about it. 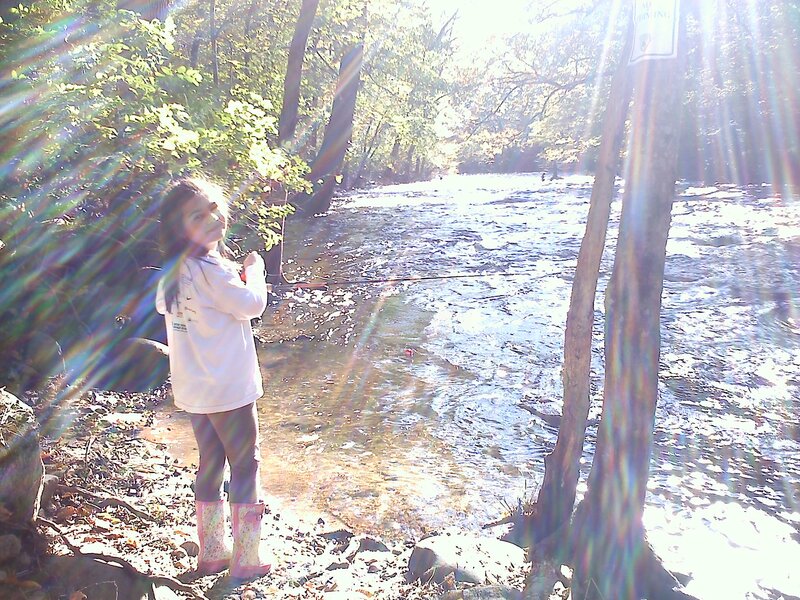 What would have happened if I told my daughter that I was going fishing and asked if she wanted to go with me? I’m almost positive she would have gone along with me. When I’m mentally committed to something, I don’t do anything half-heartedly. I don’t vacillate about going for a bike ride, increasing the intensity of my speedwork or doing strength work and stretching. I don’t let little obstacles derail me. It’s not a question of if I do something, it’s a question of how. How do I get it done? When I’m mentally committed to something, it’s more like me telling my daughter that I’m going fishing. I’m just doing it. I’m not asking a 7 year old. Given how busy and complicated life seems to be these days, it’s virtually impossible to avoid obstacles and setbacks in training and racing. The key is how I deal with them. If I’ve got the right mental approach, that gets much easier. I figure out a way to get around the obstacles and setbacks.